Michael Perry is the kind of author who makes you scrap your lead sentence five times when you write about him. His prose is so full of poignant adjectives it’s like a silage-stuffed silo at the end of autumn – warm, pungent, and ready to nourish. To be published in May, The Jesus Cow is Perry’s debut in the world of humorous fiction for adults. But it’s not a huge leap at all from ground Perry has trod both in his life and memoirs, which include Population: 485, Truck, Coop, and Visiting Tom. It’s set in the town of Swivel, which seems to bear a resemblance to many of the small towns in the northern part of the Chippewa Valley. And trouble is what Harley finds as he first tries to hide the Jesus cow and then ultimately allows his life to become engulfed with the unavoidable throngs of people eager to actualize their beliefs. Along the way The Jesus Cow grapples with the themes of true faith, individualism, and what it means to be part of a spectacle for your own greater good. 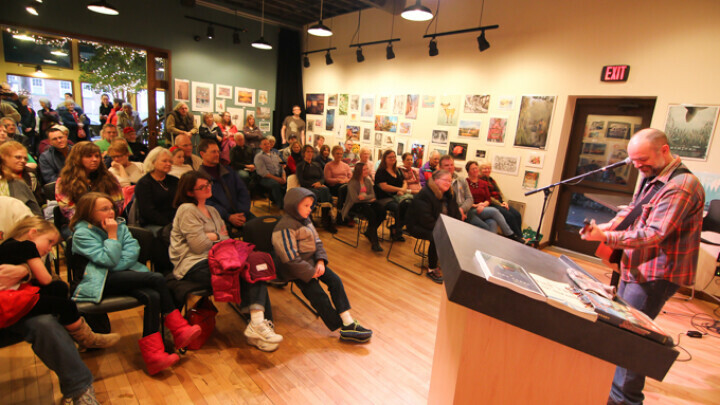 On Saturday, Dec. 13 New York Times bestselling author Michael Perry took over the Volume One Gallery for a special holiday reading, discussion, and book signing for his new young adult novel, The Scavengers.